Quaternary Science Reviews caters for all aspects of Quaternary science, and includes, for example, geology, geomorphology, geography, archaeology, soil science, palaeobotany, palaeontology, palaeoclimatology and the full range of applicable dating methods. The dividing line between what constitutes the review paper and one which contains new original data is not easy to establish, so QSR also publishes papers with new data especially if these perform a review function. All the Quaternary sciences are changing rapidly and subject to re-evaluation as the pace of discovery quickens; thus the diverse but comprehensive role of Quaternary Science Reviews keeps readers abreast of the wider issues relating to new developments in the field. 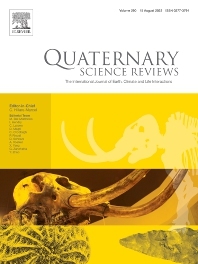 Quaternary Science Reviews includes Special Issues on topical subjects arising from recent scientific meetings, in response to significant changes in Quaternary subject matter, or to acknowledge the achievements of some outstanding Quaternary Scientist.